For those knowledgeable on the subject, the long since discontinued MN3007 IC has a much nicer sound than its little brother, the MN3207. The MN3007 are coveted by pedal builders and the D.I.Y. community for their superior sound quality. Often counterfeited, these ICs are tricky to purchase. Early in the year 2009 Malekko acquired a giant lot of actual obsolete MN3007 BBD ICs and went to work. The result is a superior lush analog chorus pedal in an unprecedented tiny enclosure¦all at an affordable price. Here is a phenomenal analog chorus pedal. Tone freaks please sit up and take notice. This transparent true bypass pedal does not add unwanted frequency, like some chorus pedals are known to do. Small and simple to use, the Malekko Omnicron Analog Chorus has two control pots: speed and depth. From subtle warble to super lush seasickness. That is all you need on a great sounding chorus pedal, and this one sounds fantastic! 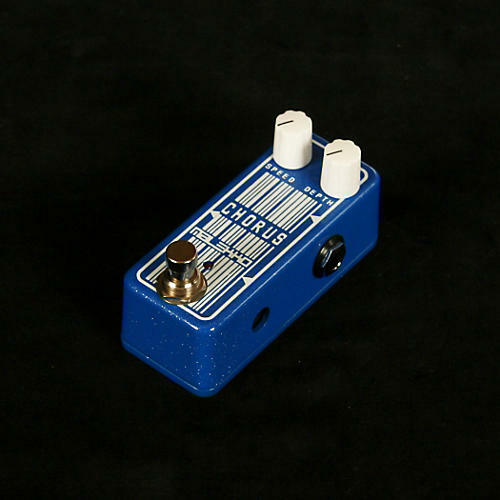 Although this chorus pedal will operate with a 9VDC regulated neg tip power supply (not included), it will sound fuller, richer, and have more headroom with a 12VDC regulated neg tip power supply (not included). Current draw is 50mA. Enclosure size approx. 3.6?x 1.5?x 1.2?.